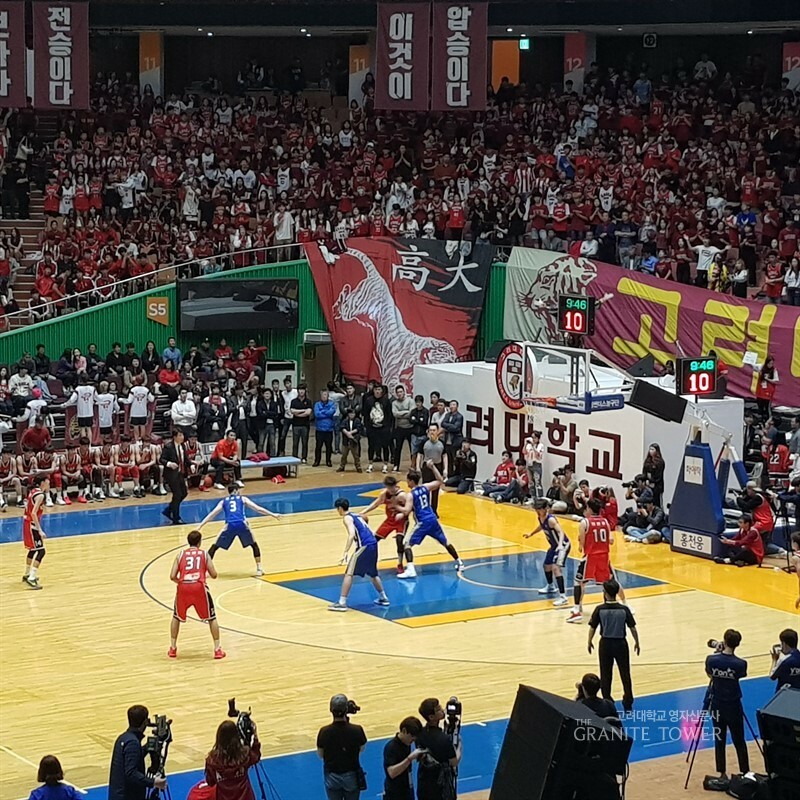 On October 5, Korea University (KU) lost the basketball match of the Annual Ko-Yon Games at the Jamsil Indoor Stadium, by scoring 69 to Yonsei University’s (YU) 72. As being a tight match of the only three point gap, the result was somewhat unpredictable and left many KU students in dismay and regrettableness. First quarter started with the YU’s lead and scored three point shoot by Yonsei’s Kim Mu sung (16, YU, G). After the dramatic first shoot from YU, however, no shoots were further made for about two minutes. Both KU and YU’s players seemed to be strained at the first few minutes, with less accuracy of shooting and frequent turnovers. After about two minutes, at Park Jun Young (Physical Education, 15, F) first scored two points by lay-up shot from the KU and helped to brighten the atmosphere of the game. This ardent atmosphere seemed to result in frequent fouling, which was the reason of deadlock after the score situation of 2-3. Continuous attempt of shooting were made from both parties, especially KU show lesser accuracy of shooting success than the YU, despite the steady attempt from the Park Jeong Hyeon (Physical Education, 16, C). Steady match of the first quarter ended as the result of 16-16. The second and the third quarter begun with the intense rebounding and constantly changing shooters, Park Jeong Hyeon attempted for a long-distance shooting for extending a gap from the score. Yet, this shooting did not end as a score but remained as an attempt. This less accuracy of the shooting resulted the frequent physical combats and fouls which provides an safe opportunity for free-throwing. The senior parks of the KU and from the YU, Park Ji Won (YU, G) were the ones who show this effort. This tight match ended as the result 40-39 at the second quarter and 49-50 at the third quarter. Final quarter had showed a glimpse of victory to KU at the beginning, the turnaround dunk three point dunk shoot from Kim Jin Young (Physical Education, 17, G). After half of the final quarter, however, KU miss the opportunity for shoots and the same attempt of the second and third quarter, the three-point shooting, and started to make a gap which led to the final result by scoring 69 to Yonsei’s 72. The close call for this year’s Ko-Yon Games could be much dramatic when enhancing and adjusting the shooting success rate. This would less focus on the intense defenses to stop the YU’s free-throwing opportunities. KU basketball team showed again of each player’s magnificent talents, next year’s game would be more outstanding after the proper enhancement was added.